It’s been 10 years since the late-great Heath Ledger passed away. 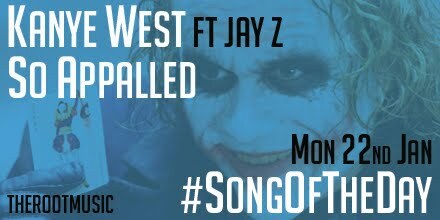 To mark the occassion, Jay Z’s ‘Dark Knight feeling’ bar makes Kanye West’s ‘So Appalled’ perfect for #SongOfTheDay. The ‘My Beautiful Dark Twisted Fantasy’ cut also features RZA, Swizz Beatz, Pusha T and Cyhi The Prynce. Posted in UncategorizedTagged Cyhi The Prynce, Jay Z, Kanye West, Pusha TBookmark the permalink.